Action cameras are popular, since people love getting videos and still shots of their favorite outdoor activities. GoPro might have made the niche popular, but there are plenty of alternatives out there. The trouble is, how many of them can actually compete with the fabled GoPro Hero? 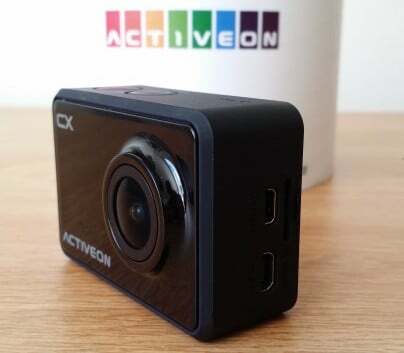 Activeon has a series of its own action cameras, and I recently tried out their CX model. Let’s see how it stacks up against the competition. The Activeon CX is lightweight and ultracompact, but that doesn’t mean it’s lacking features. The camera boasts a 6-element aspherical glass F/2.4 lens, making it shoot pictures lightning fast. It’s capable of capturing 1080P video at 30 frames per second and 720p video at 60 frames per second. For still shots, the camera has a five-megapixel sensor that can take excellent still images. The camera lens itself also has a very wide view. The two-inch built-in LCD is a nice feature the base model GoPro Hero lacks, since it allows you to easily frame your shot before you take it. For remote control purposes, the Activeon CX has built-in Wi-Fi and is controllable by an app you install on your iPhone or iPad. Using the iOS app, you can easily control your Activeon CX camera remotely. Outside of the iOS capability, the camera also has a mini-HDMI port for sending your videos or images to your television screen. 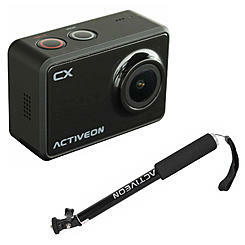 Like other action cameras, the Activeon CX has a very small form factor. This can take some getting used to if you have large hands, but Activeon has designed this camera smartly and placed the controls on top of the housing so your fingers don’t get in the way of the lens when you snap a picture. The base kit comes with a waterproof housing that will protect your Activeon CX underwater as deep as 196 feet. You also get an adhesive mount for attaching your camera to flat surfaces. What’s more, the camera features a standard tripod mount, making it quite versatile. If you want even more mounting options, Activeon has a wide variety of choices, from roll-bar mounts to chest and head straps. There’s even a selfie stick available for the camera. See for yourself what the Activeon CX can shoot in the video below, or click here if it fails to load. Activeon definitely knows how to make an action camera, because the CX stacks up nicely against the GoPro base model of camera, even exceeding some of the latter’s capabilities. It’s an inexpensive alternative to the known name, and provides all of the quality and ruggedness that you need in an action camera. The Activeon CX can be purchased directly from the manufacturer for $119.99. If you need or want an action camera with good features, but don’t want to spend a lot of money on it, the Activeon CX is an excellent choice.